This book talks about the injustices that African Americans faced as being treated as second classed citizen. They were not seen as being equal to whites and were being segregated from whites when it came to society in general. Blacks were not allowed to drink as same water fountains as whites or as this books shows, African Americans were not allowed to eat at the same places as whites and were designated to sit in places that were usually the worst places to sit. While whites were able to enjoy better sitting and had the ability to sit wherever they wanted. 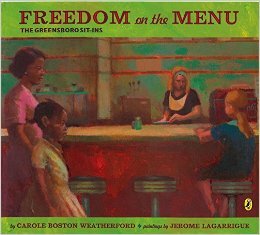 Just wanting the simple right to choose where they can eat and where they can sit to eat, is what this book is talking about and shows the means in which African Americans in Greensboro, North Carolina had to fight and protest in order to desegregate places like Woolworth. For students this shows the struggles that African Americans faced and were going through during this time period and what they had to do in order to fight for their rights and start the process of desegregating white society. After reading the book teach students a little bit about the civil right movement and tell them about other places and things that separated African Americans and whites. With this discussion we can then make our own list of things that students like to do and places they like to go to. Then after making the list tell students that they are now not allowed to use or could not go to because society told them they could not. Talking together as a class, ask students how this would make them feel if they were not able to do these things because society said they were "different". Once this is done the class will work together coming up with peaceful ideas of what they would do to gain these rights back.